PCS provides the One-Write Checks, 3-to-a-Page Checks, Pocket Checks, Check Starter Kits Your Business Needs at Competitive Prices. 3-to-a-Page checks for every need. Vouchers stubs, payroll checks. Write checks anytime, anyplace! Comes with or without deposit slips. Ready-to-go Check Starter Kits! Most kits come with checks, deposit tickets and binder. Our customer service team is available daily from 9AM to 6:30 Eastern at 1-800-770-3466. 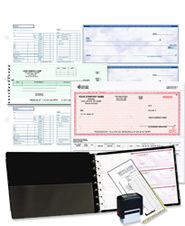 We offer a full-line of imprinted products including checks, computer checks (Quicken, Peachtree, Microsoft Money, Quicken), deposit tickets, industry and software-specific forms, envelopes and much more. All of our products come with a full 100% satisfaction money-back guarantee. Add your company logo in black and white to your form at no additional charge.